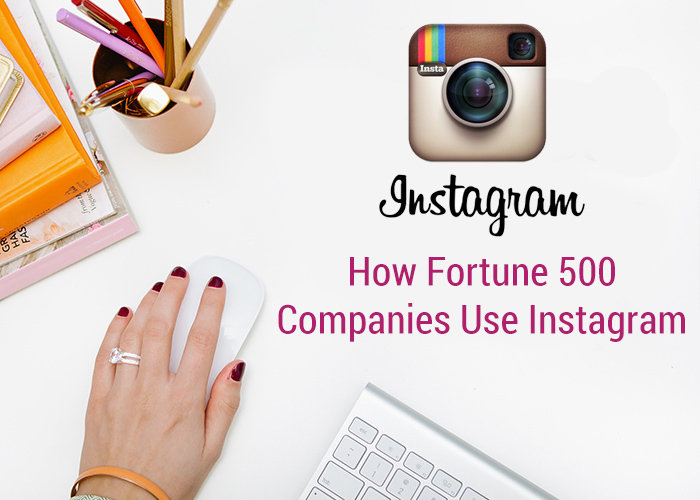 Is your company on Instagram yet? Instagram, known for its highly visual content, is a great tool for brides and brides-to-be! The bridal demographic these days love to look at pictures for inspiration and to repost. Not only is it great for brides, but the network itself is one of the biggest social media companies. It’s so easy for users to look at photos or videos as they scroll down their newsfeed and “like” or comment on some of the photos. If you’re a start up, mid-level, or major company, you should have an account to reach this demographic. TrackMaven, a competitive analysis firm, released a study that exposes how Fortune 500 companies are using their Instagram. Turns out that 123 of the Fortune 500 have the app in their arsenal! And of those 123 companies, 22% have active accounts. Some examples of the most active brands on Instagram are: Nike, Starbucks, Apple, Ralph Lauren, Target, Whole Foods and Ford. Considering that the video option in Instagram is relatively new, photos still perform better than videos. The study suggests that companies and users should know that the best time to post on Instagram is during the evenings and weekends instead of during the working hours. This is when users are most active, especially when they have some down time to search through their news feed. The video aspect on Instagram performed a lot better during the evening and weekend presuming that the audio component of the video will be a distraction at work. Aside from videos, one of the most fun aspects of Instagram is changing the filter of the photo you’re uploading. The chart below shows the most popular Instagram photo filters used by Fortune 500 companies. The study shows that the most popular filter wasn’t a filter at all but rather the untouched uploaded photo, or #nofilter, was the most-used by Fortune 500s. Probably one of the most popular features of Instagram is the hashtag. Instagram users tend to put more hashtags than words on a post because hashtags are very effective in terms of receiving more likes. 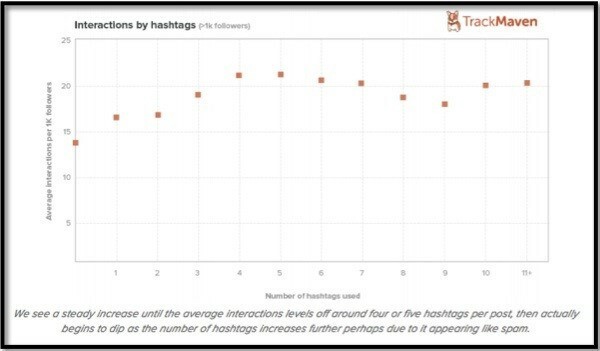 According to the study, the number of hashtags correlated to the success of the content. “Looking at the interactions (the sum of likes and comments) per 1,000 followers compared to the number of hashtags used, there is a strong correlation to the number of hashtags used and effectiveness up to 5 hashtags which has the highest average at 21.21 interactions per 1,000 followers,” TrackMaven said in its report. How can your company use Instagram to build their brands? Sabel Harris, lead marketing maven at TrackMaven, gave three tips for brands that want to bring more awareness to their company using the highly visual platform, Instagram. Videos are a huge advantage because of the slow adoption rate from the Fortune 500. This means that other brands can lead the way by providing a different variety with pictures and video. At 15 seconds long and the capability to upload videos from your videos album, brands have the ability to enhance their videos more. Pictures on Instagram are great, but taking it a step further and adding videos will make your account stand out and give you an advantage with your followers. In any other social media platform, like Facebook or Twitter for example, it wouldn’t be a good idea to include more than a few hashtags. But in Instagram, you can forget about that rule! The data shown from this study proves that for bigger brands, showing from 4 to 11 hashtags can increase up to an average 77 interactions per Instagram post. Other social media sites might have an optimal time to post, but on Instagram, users on the platform interact at all hours of the day and every day of the week. This is because Instagram users are highly active through their mobile devices and are rarely away from their phones. 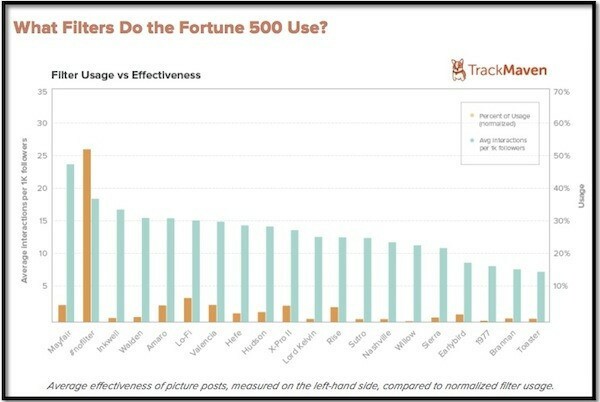 The Fortune 500 tend to post the most during business hours but there is no clear perfect time to post a photo/video.